A research-validated program that utilizes above grade-level testing to help you understand the educational needs of your child. Talent identification using above grade-level testing through the ACT or SAT. Recognition of your child's achievements"
This past year several of our 6th, 7th and 8th grade students were invited to take the ACT or SAT through NUMATS. 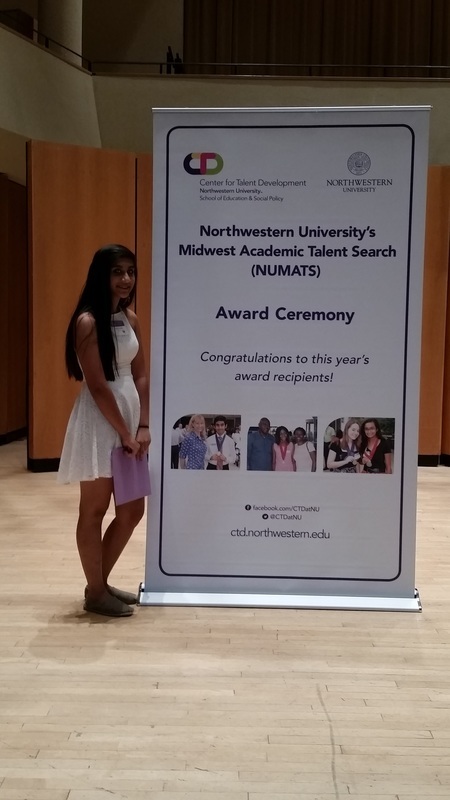 We are pleased to share that on September 12th, 2015 at Northwestern University, Evanston, Illinois our MCES Graduate Ruchita Coomar was honored. Miss Coomar was a medal recipient from eighth grade division and placed 2nd in Critical Reading category for ACT testing. Last year, as an 8th grade student, Miss Coomar scored a 35 score in the Critical Reading category. Miss Coomar is currently attending SMCC, where she is a freshman. She is an alumnae of MCES, class of 2015, where she was recommended to take the ACT test via the NUMATS program. Congratulations Ruchita we are very proud of you!